This special installation highlights a family of twentieth-century artistic innovators. 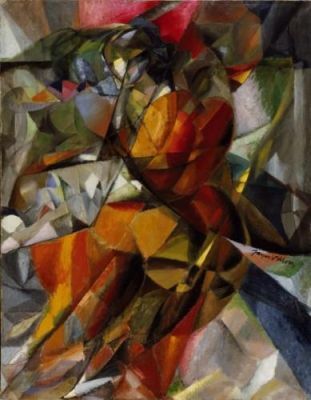 The brothers Jacques Villon, Raymond Duchamp-Villon, and Marcel Duchamp entered the public eye in 1911 as members of the Cubist group in Paris. Marcel soon decided to go his own way and became one of the most original and independent figures of his era. Their sister Suzanne Duchamp led an off-shoot of the avant-garde Dada movement alongside her husband, the Swiss-born painter Jean Crotti. The Duchamp Family exhibition marks two anniversaries: fifty years since Marcel Duchamp’s death on October 2, 1968; and the centennial of the death of Raymond Duchamp-Villon in 1918, which cut short his groundbreaking work in Cubist sculpture. The exhibition will bring together works from the collection with the addition of a major work by Suzanne Duchamp on loan from a private collection. Until August 2019, the majority of the Museum’s holdings of the work of Marcel Duchamp will travel in a special exhibition to the Tokyo National Museum in Japan; the Museum of Modern and Contemporary art in Seoul, South Korea; and the Art Gallery of New South Wales in Sydney, Australia.